Russia has activated Wagner in Syria after Ukraine, a security company similar to the hired troop of killers, "Blackwater," which the United States used in Iraq’s occupation. Russian legionaries are expected to be more active in Syria in the aftermath of "de-escalation regions" agreement signed between Washington and Moscow. Wagner, which was unofficially active and engaged in close combat in Syria since 2014, unveiled the mystery of operations after the Russian parliament approved the company’s official operation in Syria. As many as 2,000 more Wagner-linked legionaries holding Russian passports have allegedly entered Syria in early August. Thus, the number of soldiers hired by the company in Syria has reached 5,000. Among the newcomers are Chechen and Ingush native and Russian citizen Muslim fighters. Wagner members will provide the "security" of natural gas and oil-rich areas, which Russia longs to possess, as well as guaranteeing a cease-fire. Engaging in conflicts in order to support pro-Russia separatist militia in Ukraine, Wagner militia have clashed with Daesh in Syria’s Palmyra. Operating covertly, the company’s employees consist of retired military men aged between 35 and 55. Wagner has allegedly chosen the Molkin town of Krasnodar in southern Russia as the training headquarters, and is named after the walkie-talkie call sign of its commanders. There is no exact information on how Wagner is financed. However, considering the fact that training on driving armored vehicles are conducted daily using tens of Kornet missiles, it is clear that great financial support is essential. The Wagner-affiliated military men are paid $1,100 monthly during their training. They need to pass these trainings to be able to be sent to war. Moscow strictly prohibits soldiers from using social media and speaking of the operations for at least 10 years. Syrian regime and allied forces have taken the last major town in Homs province from Daesh, the Syrian Observatory for Human Rights said on Saturday, as the army advances toward terrorist strongholds in the east of the country.The town of al-Sukhna lies northeast of the regime-controlled ancient city of Palmyra.It is some 50 km (30 miles) from the administrative frontier of Deir al-Zor province which is almost entirely under Daesh control.Syrian state news agency SANA reported on Saturday that the army had encircled al-Sukhna. 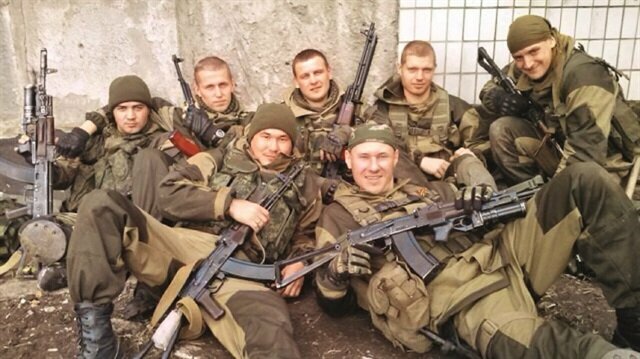 Wagner soldiers fighting in Ukraine have been paid between $1,700 and $3,350. Commanders’ salary has been raised up to $4,250. Making a collusion with the Syrian regime, Wagner has lost many of its members in clashes in Syria. Wagner is administered by Dmitry Utkin, a former lieutenant. While not much information could be found on Utkin, he is believed to appear as the head of Wagner, while the real head of company is someone else. At least three civilians were killed and six others injured in an attack on Sunday by PKK/PYD terrorist group in Syria’s northern Aleppo province, a pro-opposition Syrian civil defense official said.The fatalities occurred when PKK/PYD terrorists attacked the opposition-held Marea town, Alaa Nima told Anadolu Agency.He said a pregnant woman was among the victims while three children were among those injured in the attack.“PYD has been targeting the town for a long time with a variety of weapons,” Nima said, asserting that Sunday's attack targeted residential areas.Meanwhile, Abdulfattah Hussein, a member of Syria’s Local Coordination Committee (LCC), said that the Syrian opposition retaliated to the PKK/PYD attacks.A number of opposition fighters were transferred to Turkey for treatment after critical injuries in clashes with the terrorist group in the western part of Marea, Hussein said.PKK/PYD had captured Tal Rifaat city as a launching point of their attack against the opposition-held areas of Marea and Azaz in Aleppo province.